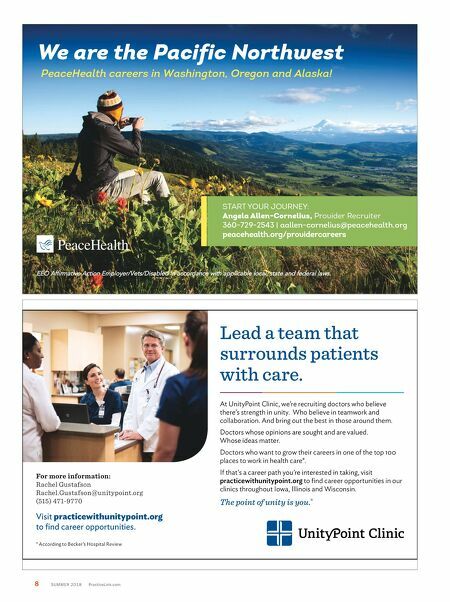 8 S UMMER 2018 PracticeLink.com Lead a team that surrounds patients with care. At UnityPoint Clinic, we're recruiting doctors who believe there's strength in unity. Who believe in teamwork and collaboration. And bring out the best in those around them. Doctors whose opinions are sought and are valued. Whose ideas matter. 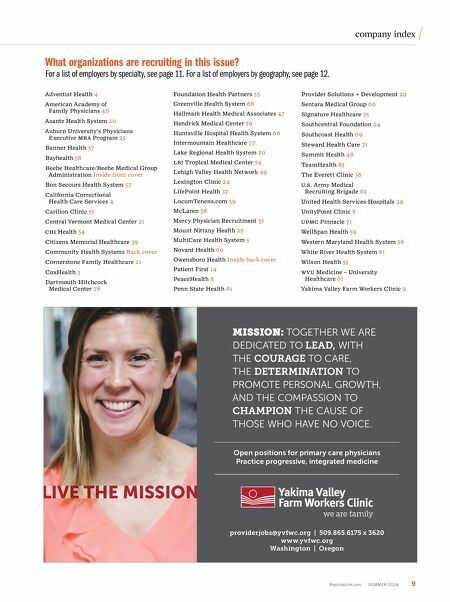 Doctors who want to grow their careers in one of the top 100 places to work in health care*. If that's a career path you're interested in taking, visit practicewithunitypoint.org to find career opportunities in our clinics throughout Iowa, Illinois and Wisconsin. The point of unity is you. ® * According to Becker's Hospital Review For more information: R achel Gusta fson R achel.Gusta fson@un it y point .org (515) 47 1-9770 Visit practicewithunitypoint.org to find career opportunities. We are the Pacific Northwest START YOUR JOURNEY: Angela Allen-Cornelius, Provider Recruiter 360-729-2543 | aallen-cornelius@peacehealth.org p e a c e h e a l t h . o r g / p r o v i d e r c a r e e r s E E O A f fi r m a t i v e A c t i o n E m p l o y e r / V e t s / D i s a b l e d i n a c c o r d a n c e w i t h a p p l i c a b l e l o c a l , s t a t e a n d f e d e r a l l a w s . PeaceHealth careers in Washington, Oregon and Alaska!